First: the invite! I created this one in Illustrator-Totoro is this cute creature that is part bear, kitty, owl…etc. Those are my kids guesses at least. lol! I kept the decor very simple since it was just a friends party, and I’m erring on the side of simple lately. 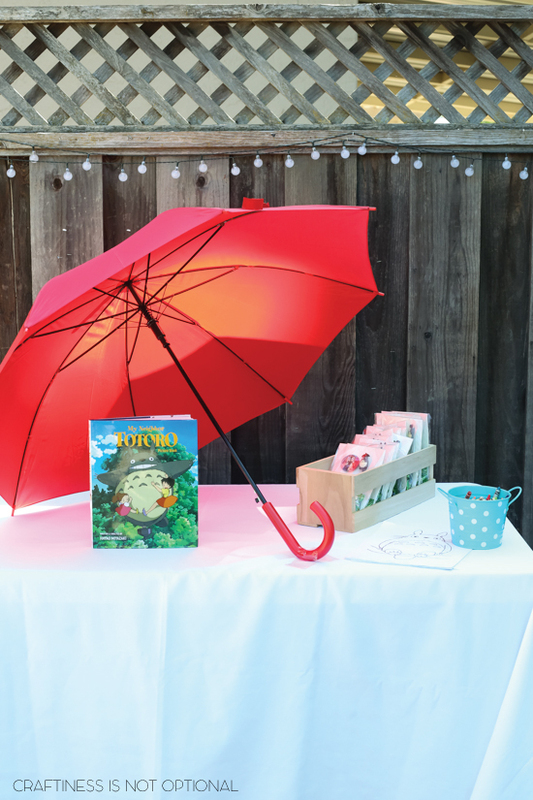 I snagged this red umbrella to display (part of the story involves a very rainy day! ), and printed off some cute Totoro coloring pages from around the internets. 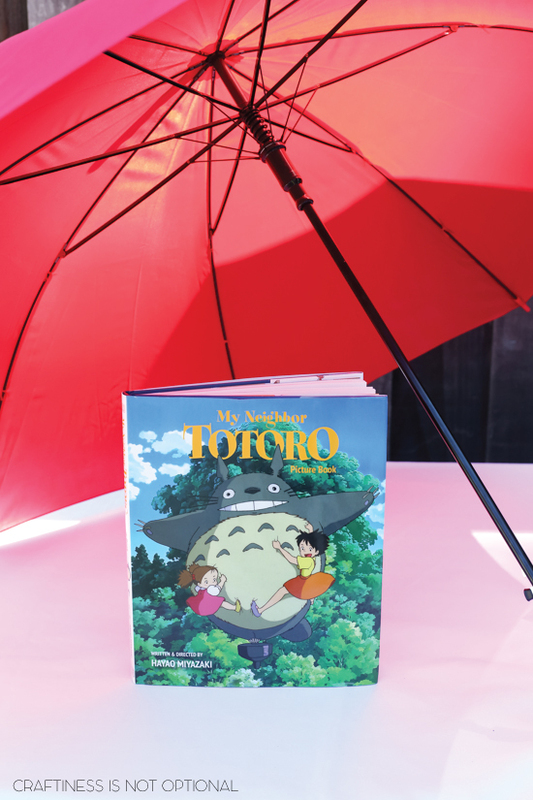 I also bought this adorable Totoro picture book so that I could read it to the kids who hadn’t seen it yet! 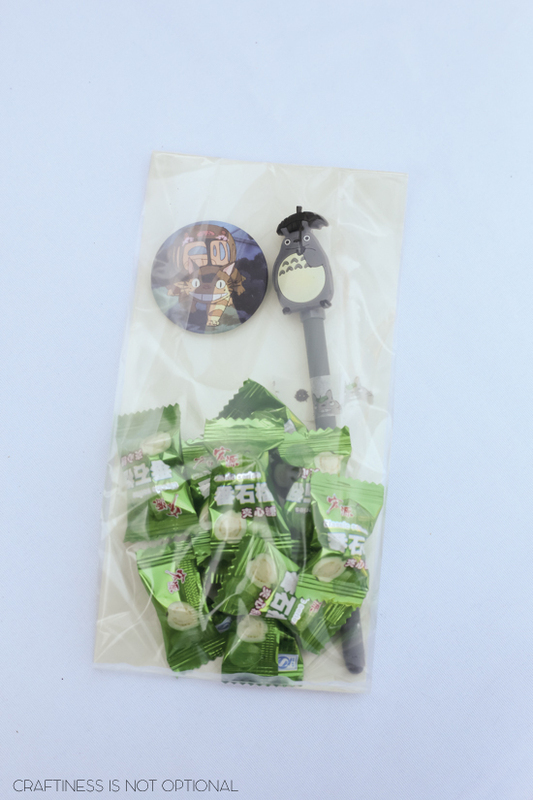 Favors were these amazing Totoro pins, pens(ebay), and guava candies! 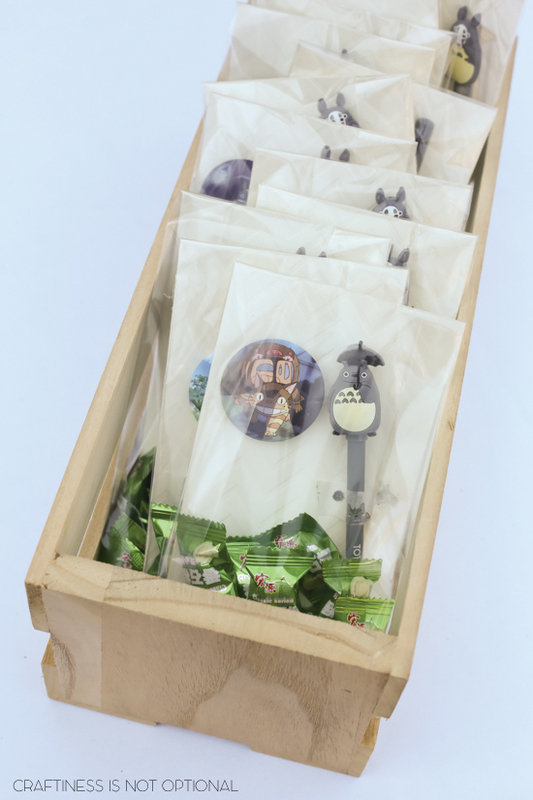 I packaged them up in some cello bags lined with card stock. 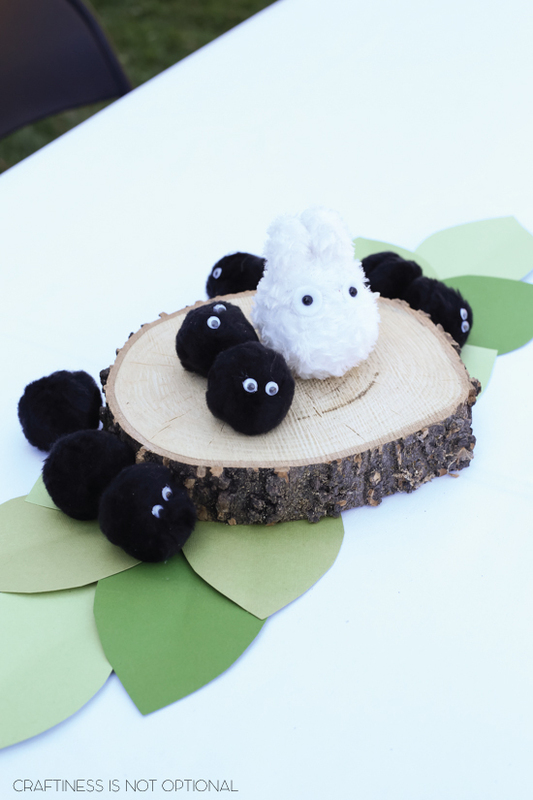 I pulled out these wood slices that I nabbed after my sister’s wedding and layered them with some green card stock leaves, soot sprites (made by gluing googly eyes onto large black pom poms), and various Totoro characters! 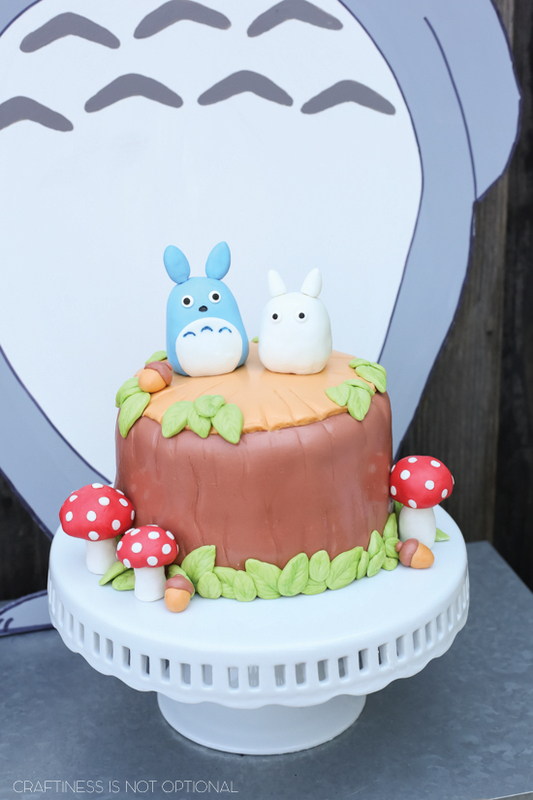 The little white Totoro is soo cute! 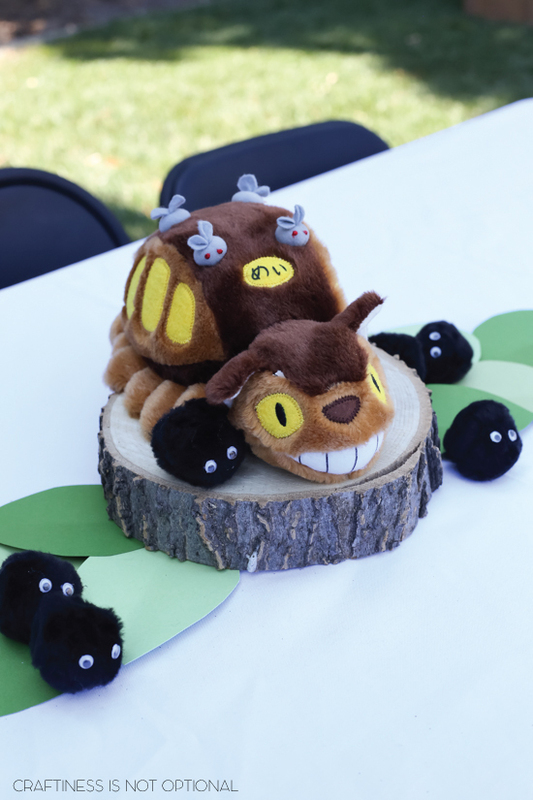 aaand on the other table, the Cat bus! 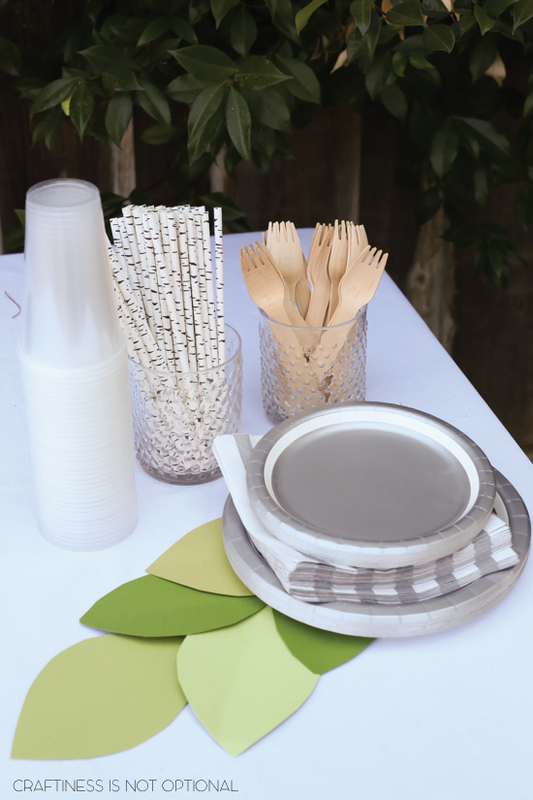 Grey plates & napkins, wooden forks, and birch straws gave the table a rustic foresty feel! I kept it simple (I feel like I’m repeating myself but seriously.) 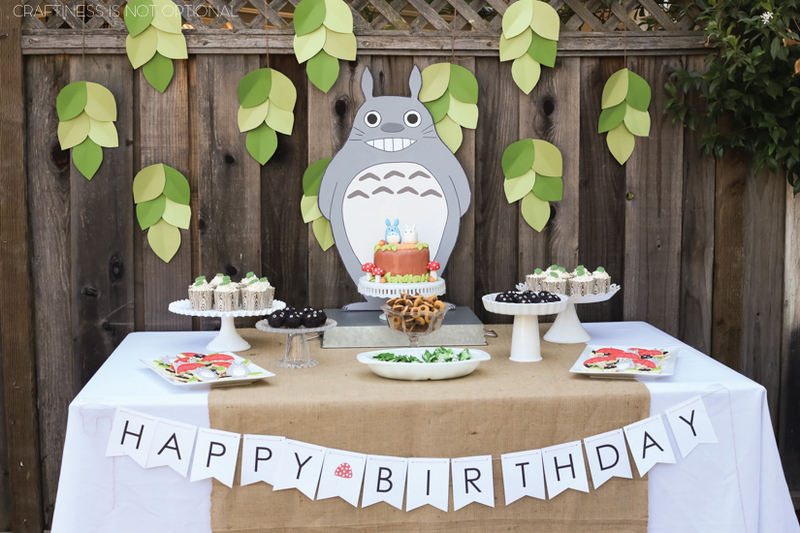 with a white tablecloth, burlap runner, and the happy birthday banner from Ava’s second birthday! which I had kept! I usually keep all my banners because they take up hardly any space! 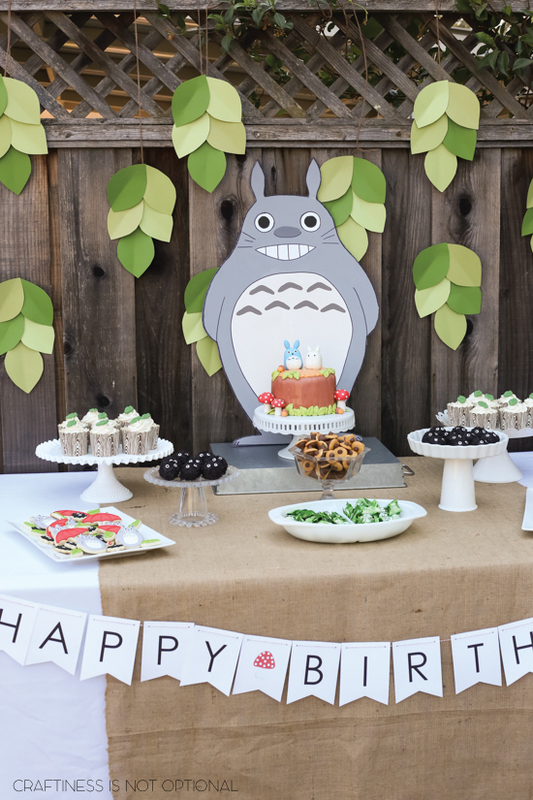 I cut out a TON of green leaves and strung them up behind Totoro to resemble the forest. Ahhh! 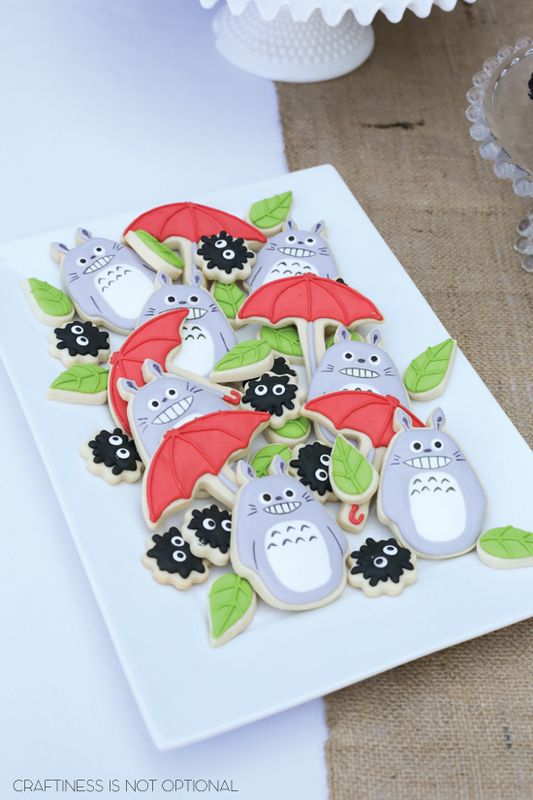 Totoro cookies! I had soo much fun making these! 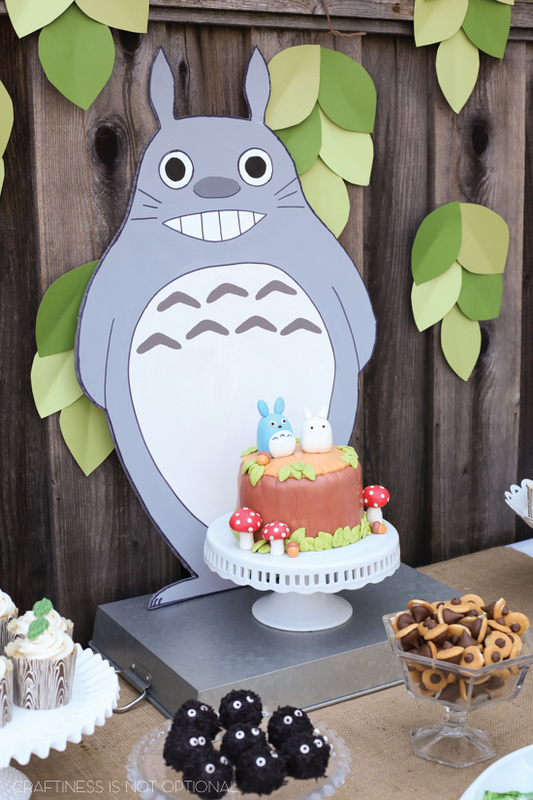 I used this Totoro cutter, and umbrella, leaf, and flower cookie cutters that I already had. Love the color combinations this party gave me! 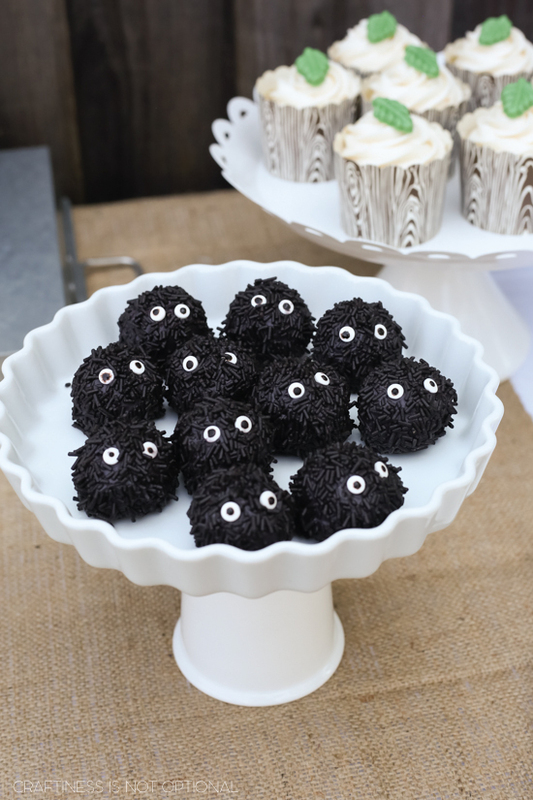 Made some soot sprite oreo truffles-rolled them in black jimmies after dipping them in black melts and added candy eyes! 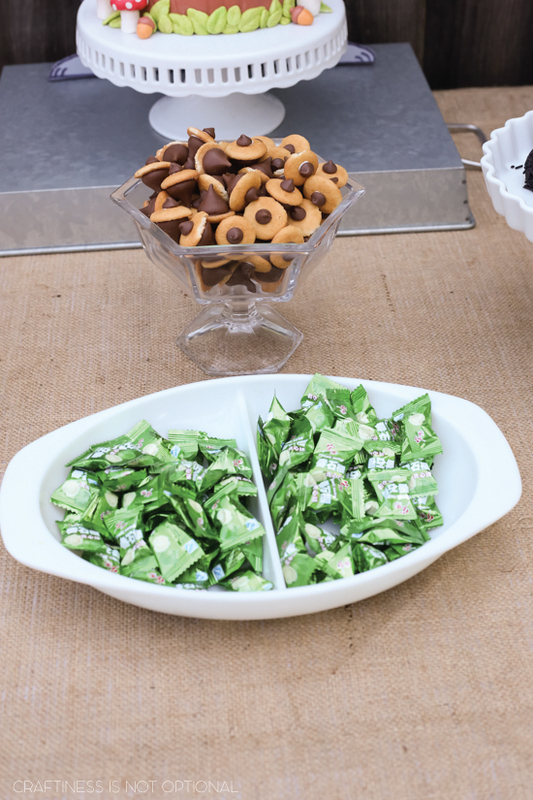 More of the guava candies! 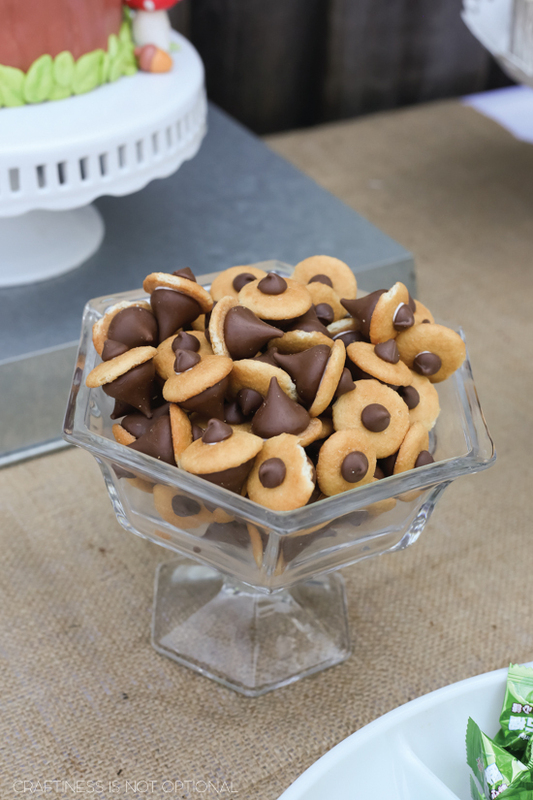 Made some chocolate acorns-just layer nilla wafer minis with a chocolate kiss and chocolate chip! I had SO much fun with the cake. It’s a smaller cake-made with these pans (which are indispensable, I’ve used them quite a few times now), and made some marshmallow fondant to decorate with. 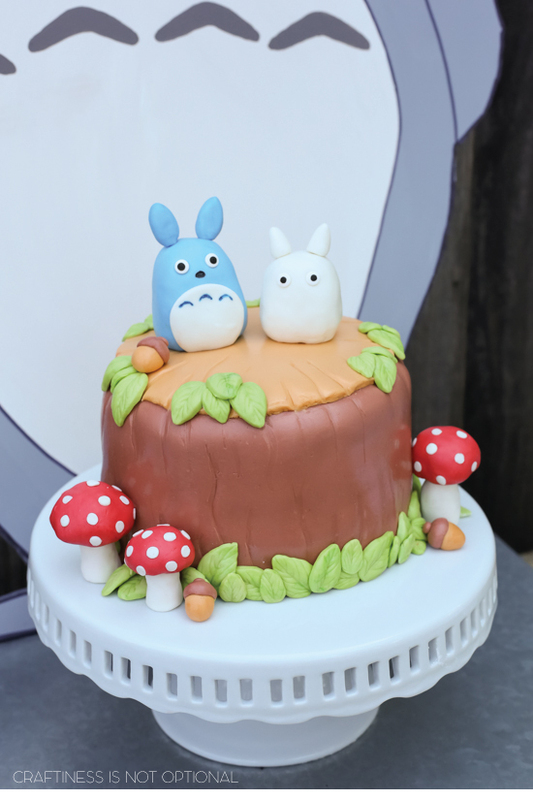 The Totoros and mushrooms were made with rice krispie treats as the base and covered with the fondant! 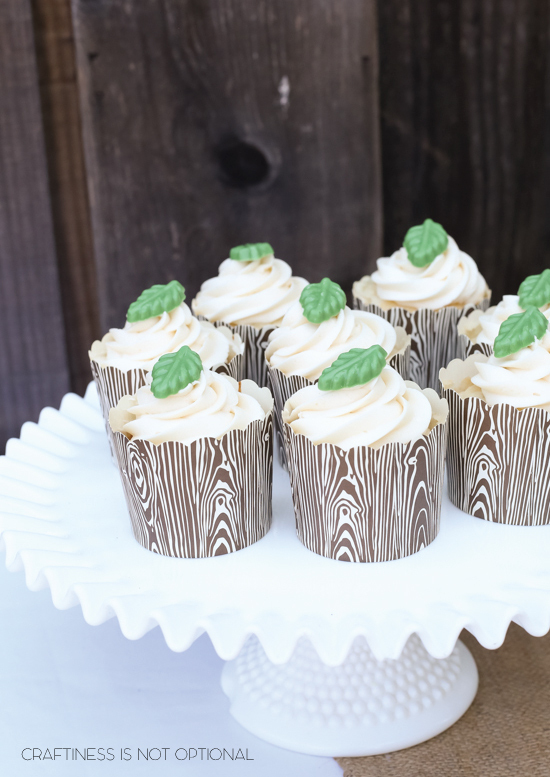 I used a leaf Wilton mold for the leaves-they turned out perfectly! That’s it folks! Hope you liked it! What a great party! Great job! BTW I made a totoro plush a while back, you might like give this a go. Here is the link http://totorosociety.com/totoro-plush-diy-tutorial/. This is Amazing!! 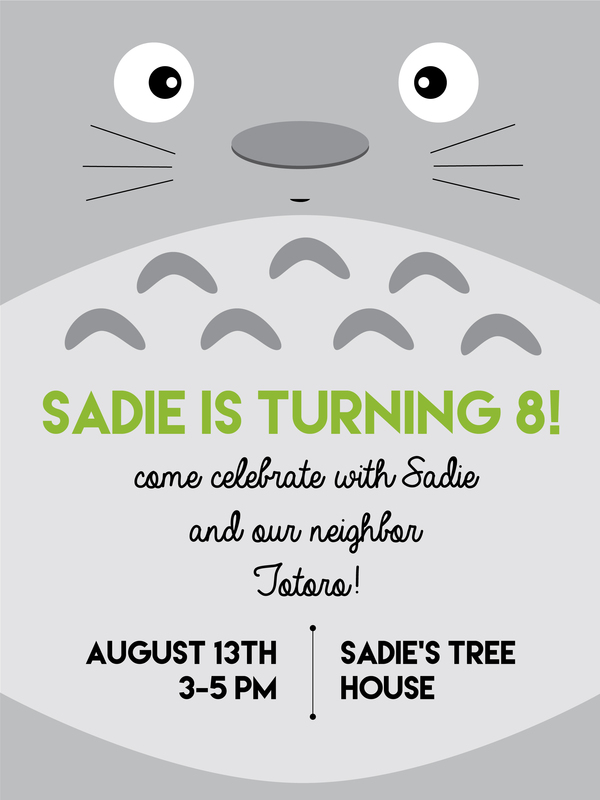 (I have a daughter Sadie, too 🙂 ) But my other daughter, Marielle LOVES Totoro!! I don’t think I have the stamina to do all of this but I had to let you know how awesome this is! 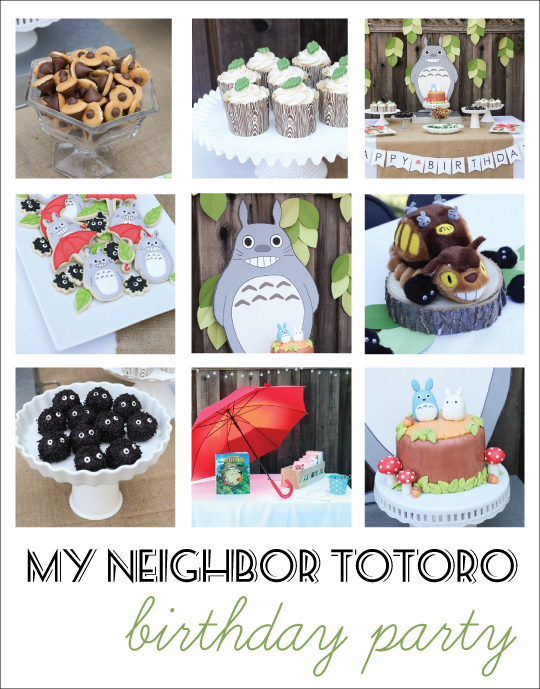 I must confess, I am a grown woman and I LOVE My Neighbor Totoro! I want a birthday party like this! ? 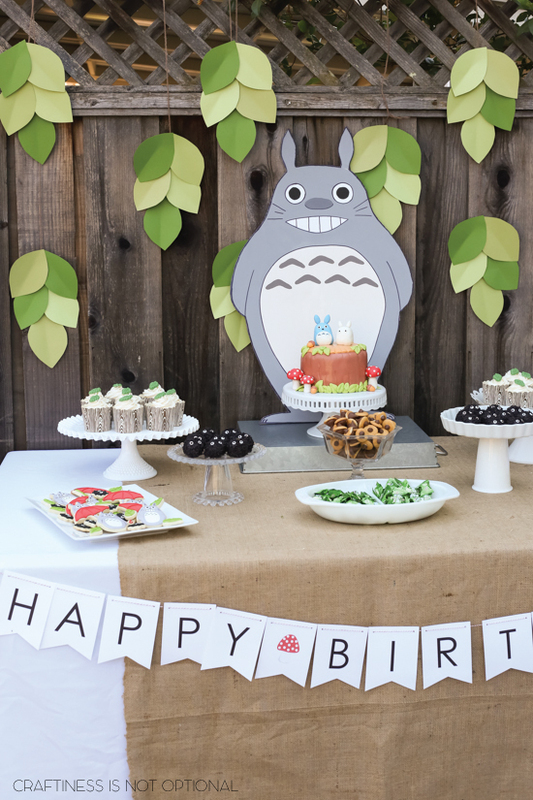 Jess, we are preparing to throw a Totora-Themed party for our 6 year old. I’m grateful for all of your wonderful ideas and inspiration. What did you use as “glue” for the nilla wafer/chocolate chips and kisses acorns? I think it was some royal icing I had on hand from the cookies 🙂 good luck with your party!